Summer is nearing an end, but zucchini are still available, and if you were smart enough to freeze some from your garden, you can have this taste of summer all year round! 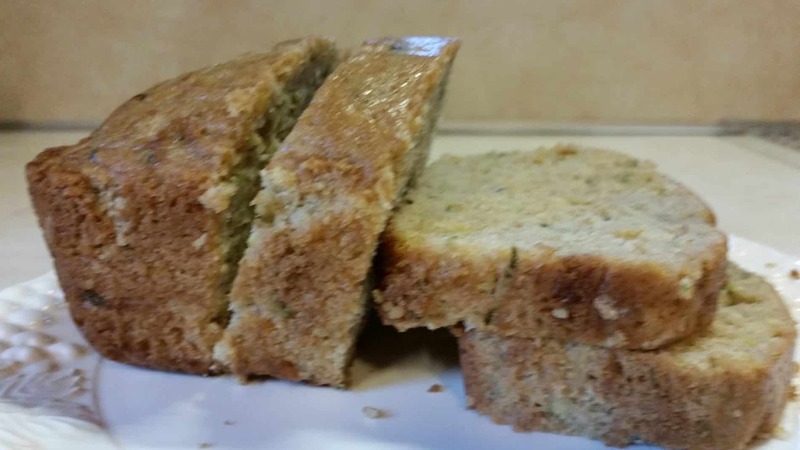 But take note: this is NOT your grandma’s zucchini bread recipe! The addition of lemon zest instead of the usual cinnamon gives this bread an extra burst of flavor. Heat oven to 350 degrees F. Grease an 8 X 4-inch loaf pan. In a bowl whisk together pastry flour, sugar, whole-wheat flour, baking powder, baking soda, and salt to combine. Stir in zucchini and lemon rind. In a small bowl, whisk oil and eggs. With a rubber spatula, combine egg and flour mixtures until flour is completely incorporated. Spoon into prepared pan and bake 55 minutes or until a toothpick inserted in center comes out clean. Cool in pan on wire rack 10 minutes. Turn out onto rack to cool completely. Cut into 12 slices. The original recipe was a low-carb version, using a granular sugar substitute in place of the sugar (I’ve used coconut palm sugar – can’t taste a difference! ); and 1/2 cup soy-flour with only 1/4 cup whole wheat flour. I also squeeze the lemon juice into the mix to add a bit more moisture, and to not waste the lemon! Every time we serve this for breakfast at Tiffany’s, our guests are pleasantly surprised by the lemony zing!